INVESTOR ALERT!!! HOME IS NOW RENTED FOR JANUARY THROUGH MARCH 2019...YOU CAN KEEP THE RENT IF YOU BUY NOW! TURNKEY 3 BEDROOM 2 BATHROOM STONEYBROOK CONCRETE AND STUCCO COURTYARD VILLA ON A CORNER HOME SITE LITERALLY IN THE GOLDEN AREA OF THE VILLAGES NEAR EVERYTHING. Enclosed lanai with extra birdcage plus more room for expansion. The very popular vaulted ceiling and open kitchen floorplan has been a sought after home for many, many years. The location of this home so close to 466 and all that it has to offer, close to Arnold Palmer and Laurel Manor and just a few minutes to Lake Sumter Landing. This home comes fully furnished (with the exception of the current owners personal belongings) Extensive, mature landscaping adorns this low maintenance style of living in The Villages. 3 full bedrooms and 2 full baths. Ceramic tile and laminate wood flooring are what you'll find throughout the main area of the home with warm neutral tone carpet in all three bedrooms. A large walk in closet in the master suite with dual sinks and a ceramic tile enclosed shower. 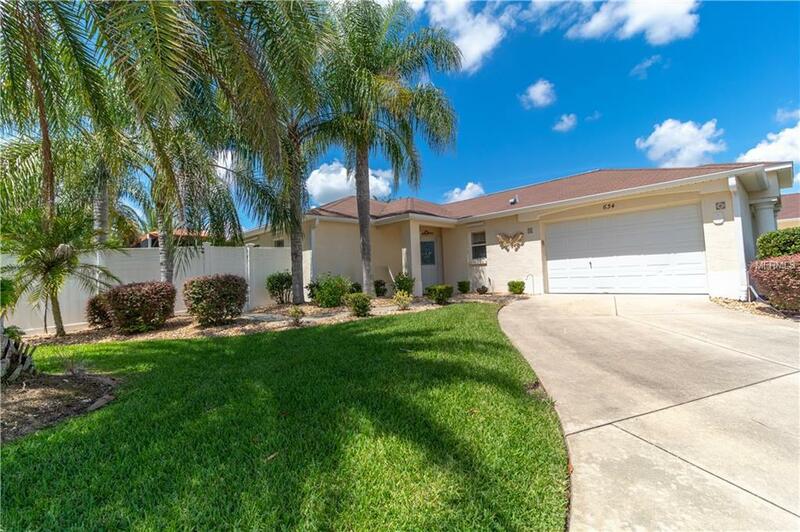 This home is ready to rent or move right in to and start to enjoy The Villages amazing lifestyle. Listing provided courtesy of Black Tie Real Estate & Invest.